Came across this project the other day and felt the urge to try it. I used cardstock instead of muslin but otherwise followed the directions. I originally made this to use as signatures for my journal project, but I think I would rather cut it up into postcards to send out as mail art. This was really fun, I highly recommend it. It's a good way to get rid of all those bits of paper you've been saving. I think I'll try the cloth version on the next go. It would make a great cover for a handmade journal. Welcome to Happy Friday. How to say Happy in other languages: Spanish-Felize, Finnish-Onnellinen and Japanese-Shiawase. I’m not sure how accurate the translations are but there you have it. Café curtains. Finishing this project was a milestone for me since I’m an insecure and untrained seamstress. Curtains, however, are pretty easy and I’m pleased with the results. I especially like these curtains because the material looks gauzy when daylight is shining through and opaque when it's dark outside. All you theater geeks know this material as scrim. I also finished my sister’s birthday present but I can’t unveil it yet. I want her to be surprised. I’m very inspired by this video. I just love her and I really need to hear over and over that one should create without looking for hidden benefits. Creativity isn't about results or sellable items. It's about process. I have a really hard time remembering that because the final product tends to be my focus. Also, there is a demonstration later in the video that shows a really cool crayon melter device in action. I may have to get one of those. Hey all. 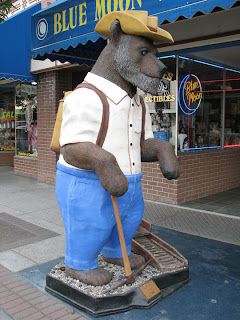 Thought I'd update you on my latest project: the Grants Pass BearFest 2010. BearFest is the creation of Brady Adams, President of Evergreen Federal Bank. Much like Chicago's famous fiberglass Cows the BearFest features fiberglass bears that have been decorated, fiberglassed, painted and placed on public display. This year's theme is bears on Harley Davidson motorcycles, tentatively called the "Wild Bunch". First let me state that I have little to no interest in motorcycles, or cars for that matter. Really, anything with a combustion engine is something of a mystery to me. Wrenches and I don't get along very well. Given that I was somewhat hesitant about taking on this project, but I got an idea and couldn't help myself. 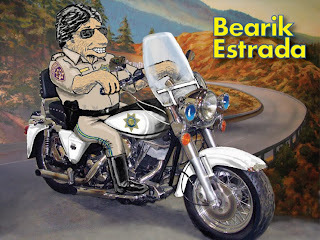 The full-sized hog I have to work with looks like the bike from the 1980's cheese-fest TV show "CHiPs", so I got the idea to do a takeoff called "Bearik Estrada". See rendering. 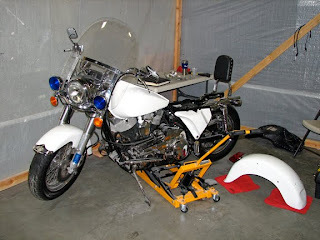 So far I've been working on converting my gray hog into a white CHP patrol bike. This involves the disassembly of gas tank, fenders, oil tank, and seat so I can paint the components. I've got the parts painted and most of them reattached to the bike. 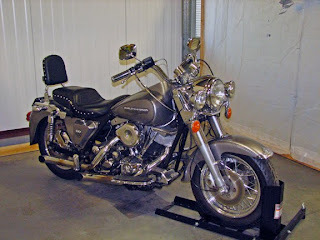 Let me just get this off my chest: Harley's are poorly designed. They're heavy, loud, and it seems that every time you want to remove one part you have to take apart at least two other items. This is obviously intended so that the average guy trying to work on his own bike gives up in frustration and just takes it to the damn shop. Venting over, feeling much better now, thank you. Friday comes around so fast... Hope everyone is having a happy week and participating in the Happy Book Mail Around with Jaime Ridler Studios. I've had a great week that started off with the Jacksonville Chinese New Year last Saturday. And I finally signed up for the Remains of the Day scrappy journal class; I can't wait to begin! I also received a packet of beautiful paper scraps from Tara Finlay to kick off my class. It's been a great week. 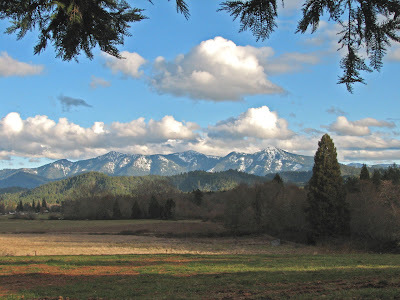 Selma Oregon, overlooking the Siskiyou Mountains. Photo by Treegeek. Tara Finlay cleaned out her paper stash and very generously gave lovely packages of paper scraps (and other assorted items) to 5 lucky recipients. I was one of them. Here is some of the loot: I think it's time to sign up for Remains of the Day journal making class and use some of this bounty. Thank you so much Tara! Is it Friday already? Back to the Happy Book Mail Around! I'm uncorking the champagne bottle after this post because, for the first time EVER! I won a giveaway on a blog. I was poking around the Remains of the Day blog again (I know, I know! Just take the class already!) and I found this blog. And I entered her giveaway and I won! Never had the Random Number Generator picked me. Until now... When I receive the loot I'll post some pictures. Gimp: I'm still working out how to use this but I was told it's very much like Photoshop. I've gotten some fun results but then I'll add or subtract something and not be able to fix it. I should probably read the "Getting Started" online manual. Inkscape: This is a vector graphics editor similar to Illustrator. It's techincal and daunting but I like puzzles and this is fun to play around with. If you start selecting random functions all sorts of interesting hell breaks loose. I'm sure it does something useful somehow. Vpike: This could distract me all day. Type in an address and take a walk down that street. Want to see the old neighborhood? Check out a place to vacation? This site is fun. I'm not sure how often it will be updated so it could get dated really fast. Spent last Saturday at the Humane Society - that always makes me happy. Two more of our beautiful gals found homes last week: Tica went home with three of the cats from the shelter. She was last seen sleeping on a queen sized bed. Cheyenne finally found a home! She's been living at the RVHS since she was pup; she's been there 2 years! She was so deserving of a home and finally someone recognized her for the wonderful dog that she is. I hope you have your fairy-tale ending Cheyenne. Since I moved here almost 6(!) years ago I've been hearing about the Waldo Cemetery. It's an old graveyard and not easy to find since the town of Waldo is long gone. You have to hike around for a bit to get to it. It's a small cemetery with a handful of markers (some are missing but are marked with posts) and all the graves are pre-1930s. Most markers are from the mid 1800s. I can't help but wonder- who were these people? What did they look like? What did they care about? What did they dream about? Were they loved and missed by family back east? What was their life like in the southern Oregon wildlands in the 1800s? They couldn't just trot over to Shopsmart or Dairy Queen when they needed a bite to eat or pop on over to the clinic when they were sick. We can read history books and go to reenactment villages but I don't think we can ever really understand what life was really like for anyone in the past. There are so many complicated layers to a society at any given point in time that I think it's not possible to really know. I wish someone would invent a time machine! It’s Friday again. Time for my weekly happy for The Happy Book Mail Around. The Giggle book is on its way to the second recipient in Montana. Only 2 more to go and I’M NEXT! Yippee! -Terrence Murphy & Elmo: This one is for the dog and kid lovers out there. -Finished projects: For the great procrastinators…scroll down to the post below. I actually finished these projects. Finished them completely. It may not look like much but for me, a big deal. -Crystal Caves: This one is for the adventurous. It would be a life altering experience to walk through this cave. I’ve been in caves before, but this is unlike anything I’ve ever seen. -Artfest: For the creative souls out there, here is your chance to attend this amazing event. Free. No, really. Some very generous soul has donated her spot. Some very lucky soul will get it for a hundred words or less. -Remains of the Day: For the book makers & journal lovers. This is the class for you! I’m saving my pennies because I want to take this class so bad I can taste it. Here are links to some of the student’s finished journals: tatterededge, sabinblog, ginarossiarmfield, magpiejst and tyggereye. These journals just resonate with me. I'm sewing up a storm but I'm not sure it'll be the same without Mary Ann's expert instruction. Hope you have a happy Friday! Unlike these two. 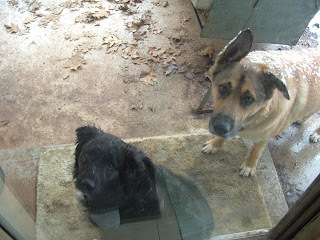 The pathetic looks they can give when they think they are being wronged! I finally finished up the few projects I've been working on. Trying to clear the slate so I can begin work on my handmade journal. I've been gathering paper scraps and the sewing machine is at the ready.